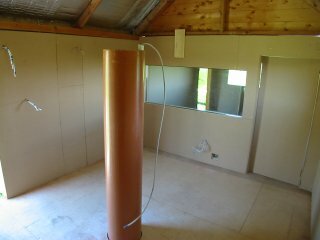 Work began in earnest on construction of the warm room today. 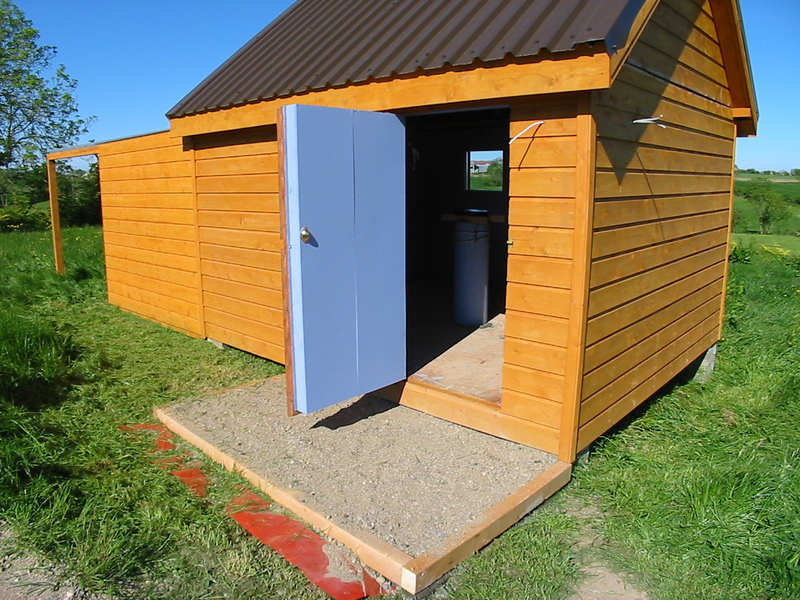 To provide as much head room as possible, the floor is stepped down from the main observatory floor level. Again 7" by 2" floor joists were used along with 4" by 2" lumber for the wall and roof studding. When the studding for the roof was installed, we got a height of about 5' 10". 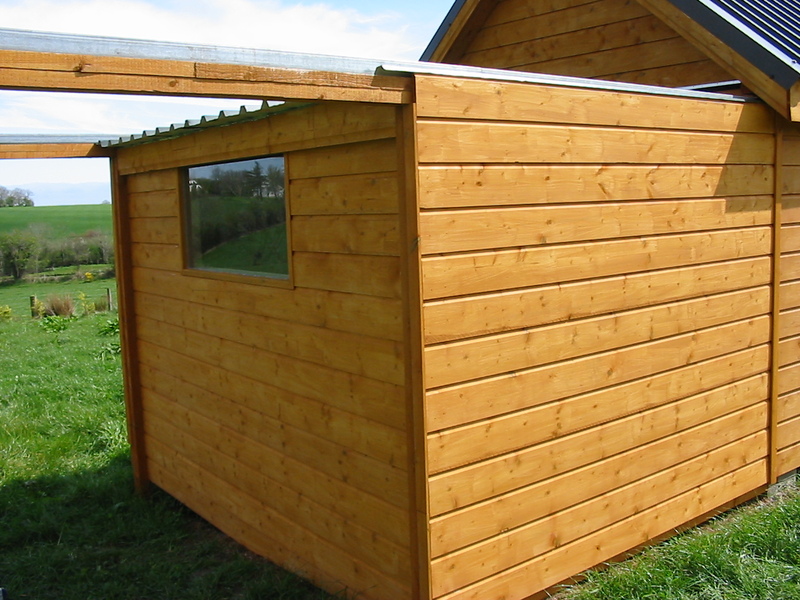 The roof slopes by just 2" from south to north to provide as much headroom as possible. This should still provide a perfectly adequate slope for the rain to drain off. I also left room for a window on the north side to provide some natural lighting into the warm room. When I put the sheeting on the roof, I can then cut out the door between it and the main observatory and then work on insulating the new studding and covering the walls with MDF. One thing which will prove difficult to sort out is ensuring the roof is completely waterproof, since it is below the horizontal runoff posts and track. Probably what I will do is run some lead flashing from the roof sheeting up to the horizontal posts and underneath the track. I will also need to do something similar where the new roof meets the north gable of the main observatory. Over the last few days, I applied 3 coats of wood preservative to the outside of the warm room and 1 to the inside. Should keep the wood worm at bay for a few years<g>. After a week spent holidaying and losing loads of money to the slot machines in Las Vegas, I've had some free time to work on the observatory. I've installed the MDF on the inside walls over the last few evenings. The 1/4" MDF is screwed to the studding with 2" wood screws and really improves the rigidity of the observatory. All the 3 sides bar the North side which will have a door and window into the warm room are completed. It really does finish up the inside nicely. 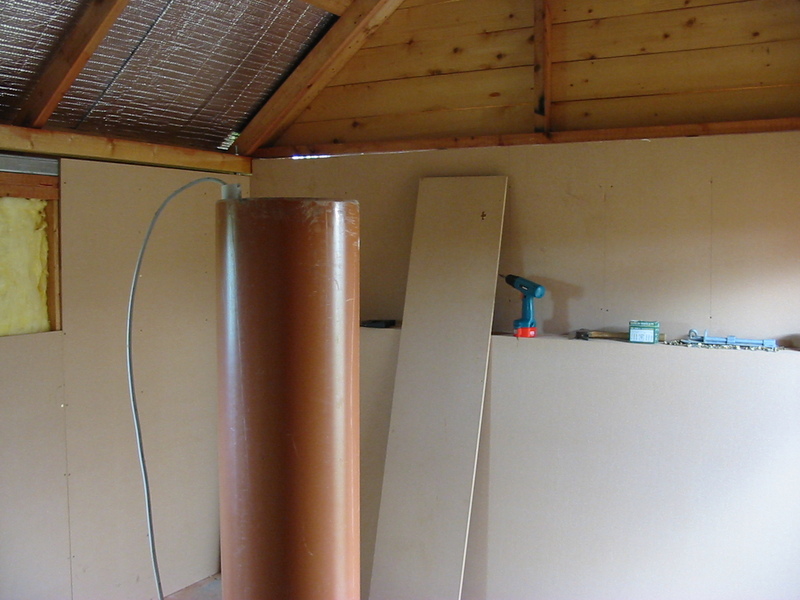 Before I complete the MDF on the North wall, I need to cut out for the window and devise some mechanism to allow cables to be easily run from the warm room to the main observatory while at the same time, avoiding any cold draughts from coming into the warm room. Probably what I will do is install a 4" duct low down in the north wall. 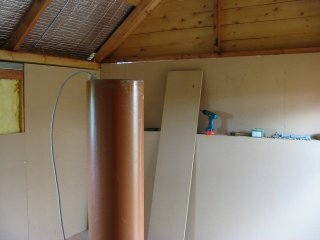 This will allow me to run the cables which connect the telescope to the computer underneath the carpet which I will lay in both the main observatory and warm room, and run them straight into the back of the computer which will be setup in the warm room. 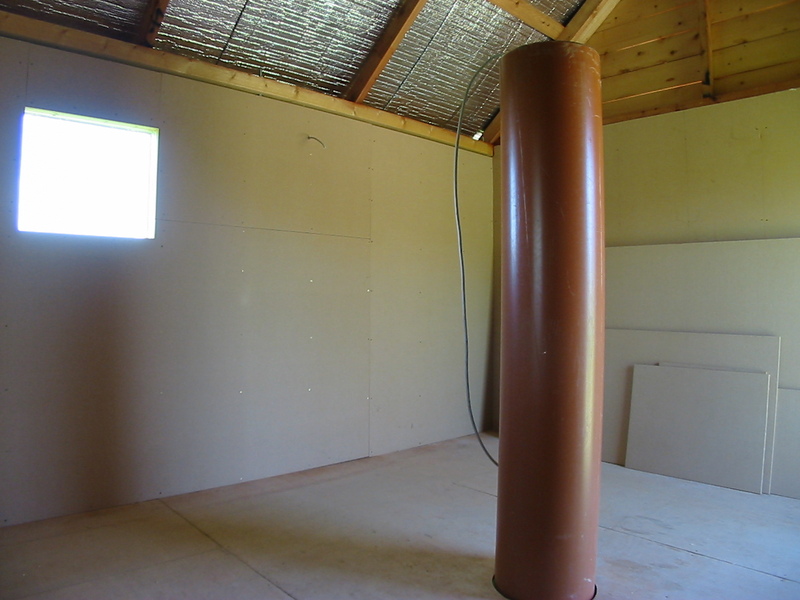 Also, hopefully next week I should be able to install the sheeting for the warm room roof so that I can complete the installation of its insulation and MDF. Installed the roof of the warm room today. 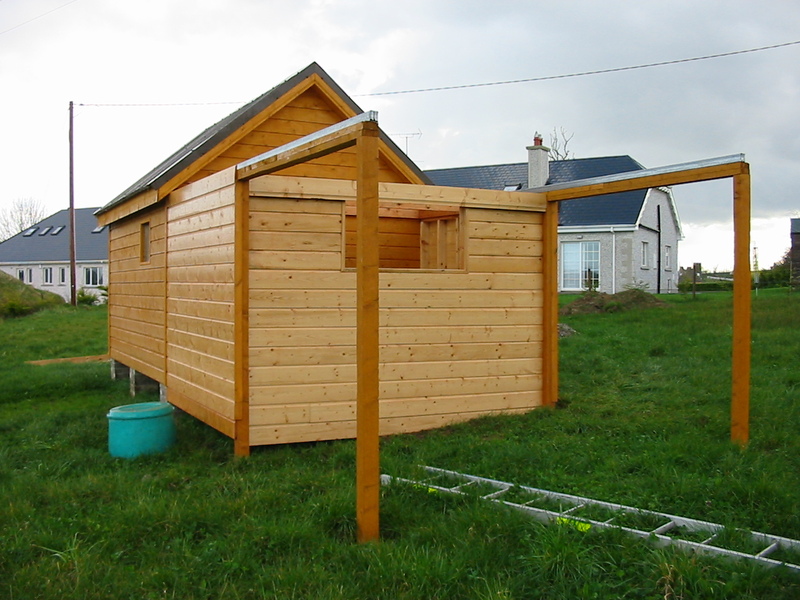 I could only get green sheeting for the roof, but due to the shallow angle of the roof, the colour difference is not noticeable from ground level. To fix the sheeting, the track on the run off rails was temporarily unscrewed and the sheets were slid up underneath them. The rails were screwed back over the roof sheeting and sealed with the help of some builders mastic. The edge of the sheeting sits tight over the top of the shiplap walls on the East and West sides, resulting in a nice watertight finish. 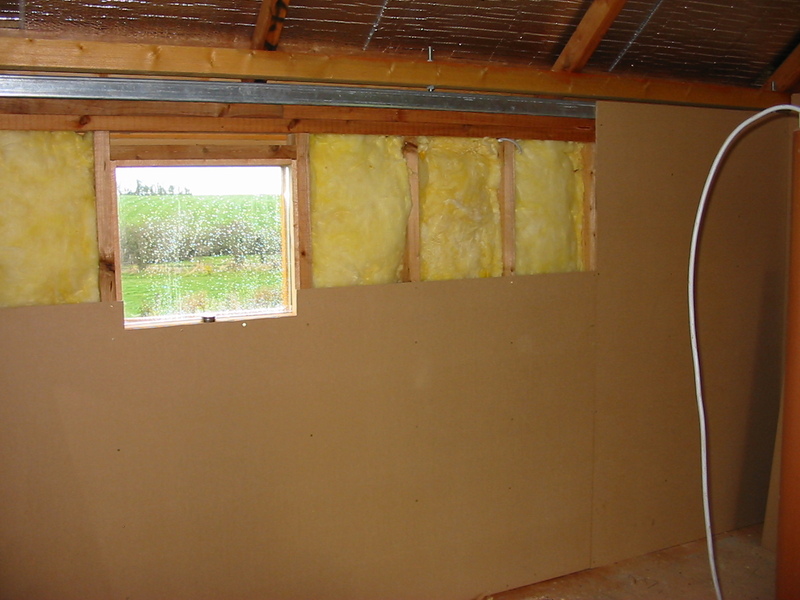 To avoid condensation on the inside of the sheeting, standard 2L2 insulation was installed underneath the sheeting. 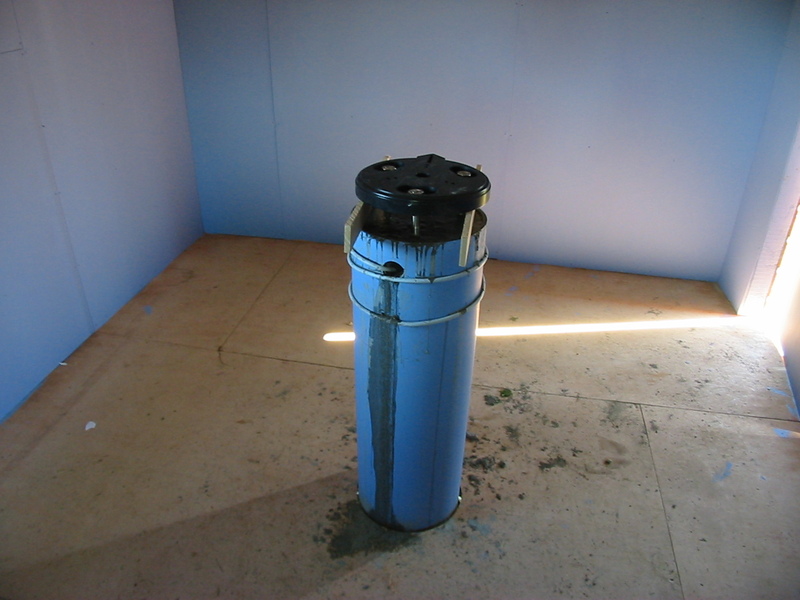 In addition the joins of the 2L2 insulation were sealed using special sticky silver tape. All this insulation should really make the warm room warm!!. I'm awaiting delivery of some custom flashing to complete the waterproofing of the warm room where the roof meets the gable of the main observatory. Glazed the window as well as painted all the outside of the new warm room. 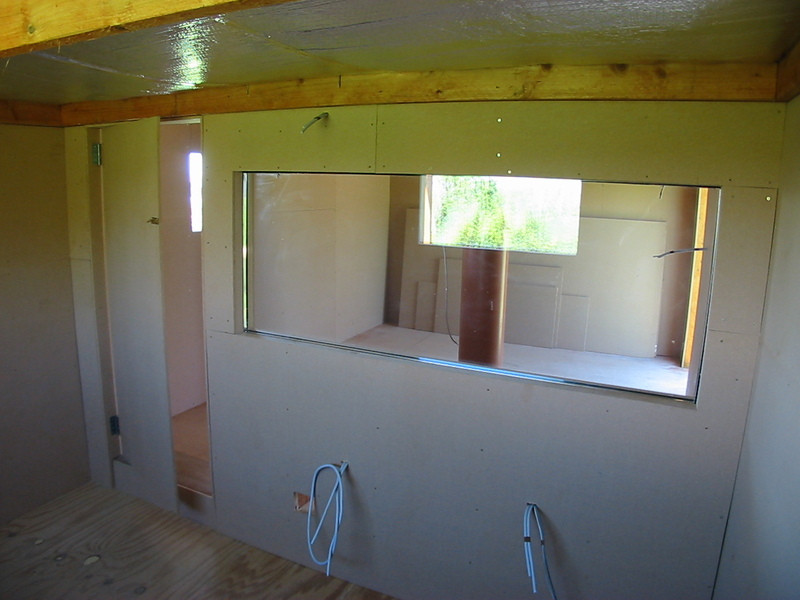 Also cut out the door into the warm room, installed all the insulation in the studding as well as the MDF on the North, East and West walls. Got a spare double glazed sheet of glass from Paddy for the window between the warm room and the main observatory. It is more than 5 foot wide and almost the full width of the North wall. When installed it will add a lot more natural light to the warm room. I also cut out the studding in the wall and constructed some new studding to fit the new window into. I also cut out a small four inch square hole underneath the window and close to the main observatory floor, where I will be able to run cables from the telescope into the warm room. I also redirected the phone line, one of the network points, two of the power cables and light point on the North wall of the main observatory into the warm room. I will now have two double sockets in the warm room, as well as one phone, one network line and one light point. In the main observatory, I will have one network point, two double sockets (one on the telescope pillar) and two light points. Hopefully later in the week I will be able to find some time to install the new studding and glass. Pictures to come! Cleaned up the inside of the observatory in preparation for painting. The colour I have decided on is a dark blue appropriately called Moonshade. Got the inside of the observatory painted earlier this week. The colour turned out a bit brighter than I thought, but when I put up some star charts etc, the colour will not be as imposing. Also got some office furniture for the warm room this week. Today, I got the pier filled today with concrete. We first had to set up the telescope on the tripod together with the pier plate and wedge and adjust the tripod height until the roof just cleared the top of the telescope when rolled back. I had of course first to adjust the wedge to suit my latitude of 52.55 degrees North. I created a simple paper template to set the angle of the wedge, which is 90 - 52.55 = 37.45 degrees from the horizontal. The wedge provides quite a bit of adjustment in altitude, so again there should be no problem making final tweaks. When we had the pier filled with concrete, we then set the pier plate into the wet cement, made it roughly level and ensured it was aligned up north / south. The pier plate provides +/-10 degrees in azimuth adjustment, so making the final tweaks when the concrete is set should not be a problem. We left the L bolts protruding 4 inches from the top of the pier. To avoid the pier plate sinking into the wet cement, we rested the pier plate on 2 strips of wood sitting on top of the pier. 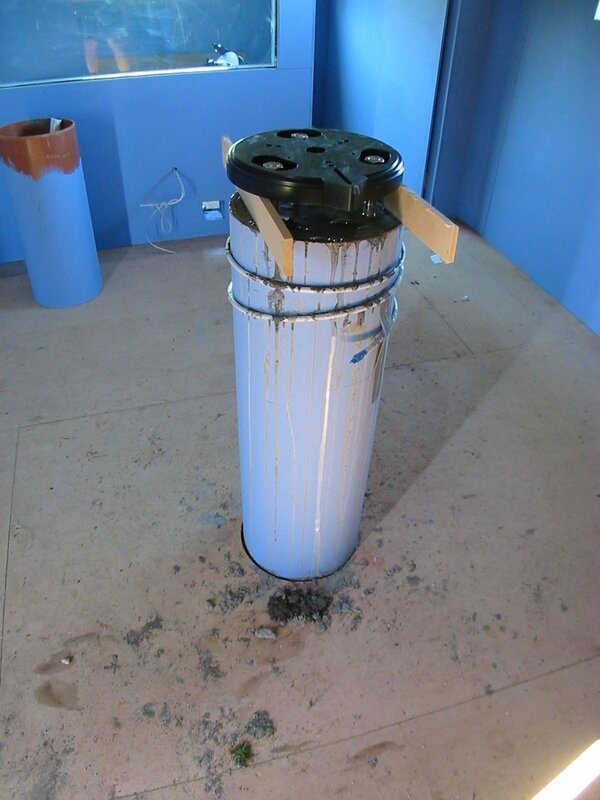 I will get the electrician back in the next few days to do the final fixing. In one of the pictures below you can also see the power cable coming out the pier on the north side. We used a 90 degree bend to get the pipe to come out the side. This will allow a nice neat double electrical socket to be installed on the pier. We also created a step outside the door of the observatory with gravel. This should keep the outside of the observatory relatively dry, come Winter.